Thong Chai Yee Say was established by a group of migrants from China in 1867. The name “Thong Chai” was derived from the Chinese word 同 (tong), meaning “the same” and 济 (ji), meaning “to help or relieve”. Thus its name bears the ideals held by its founders, which is to treat all equally and to help without discrimination. The institution had humble beginnings at a rented shop house at 31, Upper Pickering Street. When the Governor of the Straits Settlement, Sir Cecil Clementi Smith, heard that Thong Chai was assisting the poor and relieving the sick, he praised the charitable organization for its welfare work for the community. 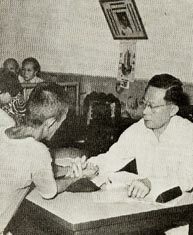 He exercised his right empowered under the Crown Lands Ordinance enacted in 1886, and on behalf of Queen Victoria, granted a piece of land totaling 8380 sq ft at Lot 13349 of Kampong Malaka in Singapore to Thong Chai to build its own premises, so that the residents could get free Chinese medicine and treatment. In 1892, the building was completed. On November 14, Sir Clementi officially announced the grant. The official opening was well attended by VIPs. On the same day, Thong Chai Yee Say was renamed Thong Chai Medical Institution. From 1867 to 1929, Thong Chai adopted the General Managers Systems. There were 12 General Managers, 12 Assistant General Managers and 60 daily duty supervisors. At the end of every year, there would be a general managers meeting to elect reputable business proprietors – 6 each from the Hokkien and Cantonese groups to form the 12 member presidium. In 1960, the management began to plan for the demolition of the Wayang Street premises to make way for a bigger building. 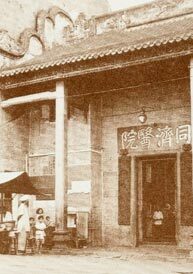 However, in 1973, the building, styled as a traditional Chinese architecture, was gazetted for conservation under the Conservation Act. The sub-committee in charge of the re-building project approached the URA for assistance in allocation of land for the construction of the new building. The URA gave the sub-com an option to purchase a site at Chin Swee Road for the new building. Consequently the land was purchased and the management started planning for the new building. With generous donations from the public, the 10-storey Thong Chai Building was completed and the medical Institution moved into the new building in May 1976. 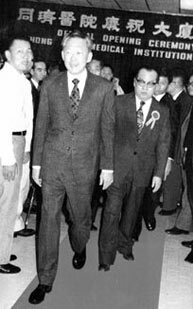 It was officially opened by the Prime Minister, Mr Lee Kuan Yew on 25 November of the same year, ushering in a new era. To keep up with the changing times, new additions such as a TCM library and herb displays were set up. Seminars and lectures were conducted to upgrade the knowledge and skills of practicing TCM physicians. Renowned professors from China and other parts of the world are invited to the institution to share their professional knowledge. In 1994, scholarships were offered to our physicians for further studies in China. When they returned, the institution took a big step into specialized treatment for oncology, infertility, hypertension and diabetes, acupuncture and kidney diseases. We have 6 physicians with Doctor (PhD) Degree in Chinese Medicine presently and many more in the process of studying part-time for higher degrees. In 1996, the management recognized the need for a major upgrade in which information technology should be more effectively used to improve services. Electronic queueing system and computerized TCM system were installed to provide orderly treatment for patients and to facilitate faster and more efficient service to our patients. As Singapore Thong Chai Medical Institution moves beyond its 150th anniversary, its core service is still very much in demand and its contributions to the healthcare system of our nation is not insignificant. Thus, it will continue to provide entirely free medical consultation and free herbal medicine to all people irrespective of race, religion or nationality. In order to manage the donations, funds and reserves of the institution in a more transparent manner for closer adherence to the code of governance for charities, so as to ensure the future development of the institution and the framework of a solid economic structure to enhance its core program, the 116th Board of Directors of the institution resolved to establish the “Thong Chai Foundation” in 2017. Concurrently, a management committee and a supervisory committee for the foundation were formed to manage and supervise the management and use of the funds.